Technical | 50 Westerns From The 50s. Riding the long, dusty trail through 50s Westerns. 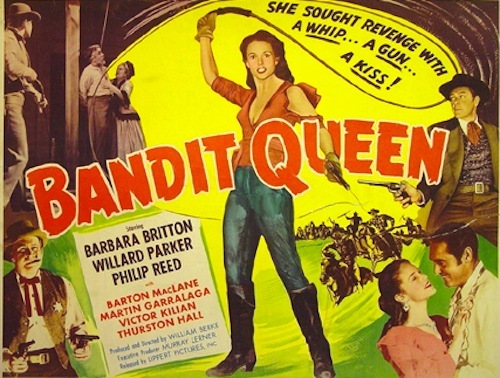 50s Westerns DVD News #180: Apache Chief (1949) And Bandit Queen (1950). There’s a cool twin bill coming in July from Lippert Pictures, Kit Parker Films and VCI — Apache Chief (1949) and Bandit Queen (1950). In a way this is pretty standard stuff, but it’s from the Indian’s point of view which freshens things up a bit. Russell Hayden and Fuzzy Knight are on hand, which helps out a lot. Fans of technical stuff will appreciate that Apache Chief was one of a couple dozen films shot with the Garutso Balanced Lens. The credit reads: “Introducing the latest scientific achievement in motion picture photography, the Garutso Balanced Lens, a new optical principle which creates a three dimensional effect.” The Wild One (1953), the Brando motorcycle picture, is probably the most high-profile film shot with the lens. Barbara Britton, Barton MacLane, Vasquez Rocks, 70 minutes. What else do you need to know? William Berke was a very prolific director, working extensively for Sam Katzman (directing several Jungle Jim pictures) and Robert Lippert. See his name in the credits, and you’re pretty sure to have a good time for the next 60 minutes or so. Welcome To My Blog. Now Go Read Something Else. Some good stuff out there on the web today. Sadly, none of it is on here. An impeccably researched article/page at 3D Film Archive. Clears up a lot of stuff we’ve all being wondering and arguing about for years. Laura’s profile over at ClassicFlix not only clues you in on what an all-around creative guy he was, but lists his Westerns that are available on DVD. Screening: Hondo (1954) At The World 3-D Film Expo. 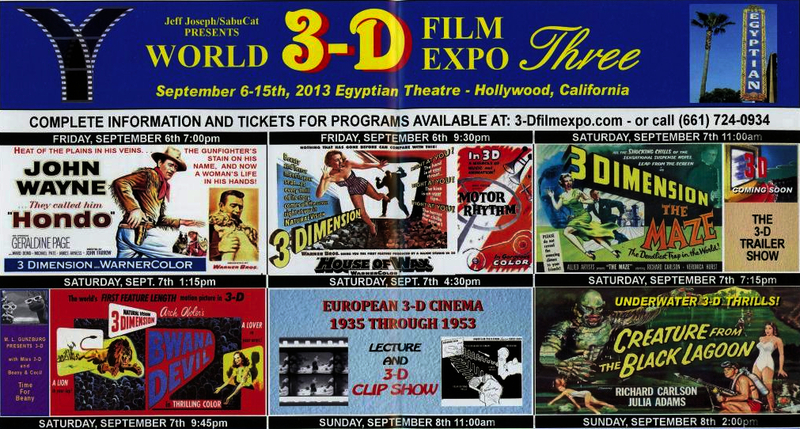 The third World 3-D Film Expo kicks off September 6, at the Egyptian Theatre, with a rare 3-D screening of Hondo (1954). 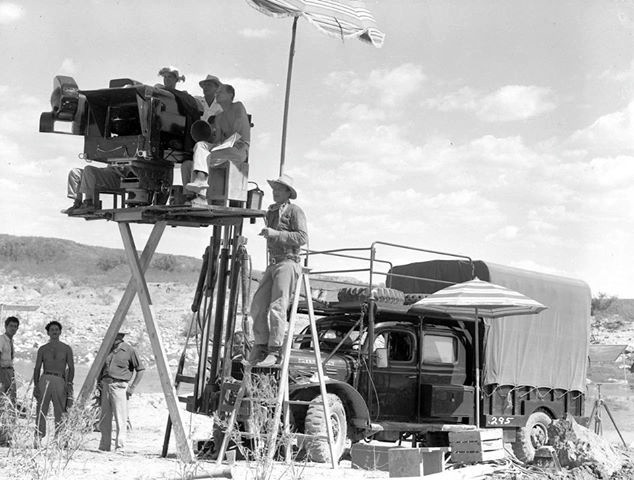 Above, that’s John Wayne on the ladder watching as a shot it being set up (that gigantic thing on the lift is the Warner Bros. All Media Camera). Other 3-D Westerns being shown during the expo: Douglas Sirk’s Taza, Son Of Cochise and Budd Boetticher’s Wings Of The Hawk (both 1953). 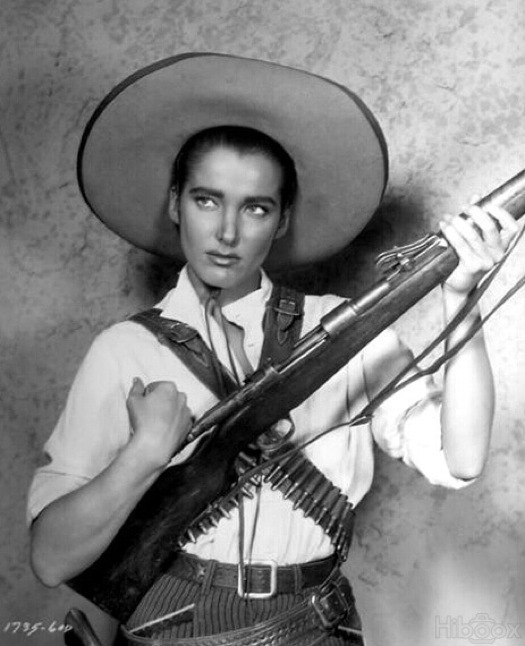 Julie Adams will be on hand for Wings Of The Hawk. Who knows how many more 35mm 3-D presentations we can count on? Rio Bravo (1959) In Cinemiracle? 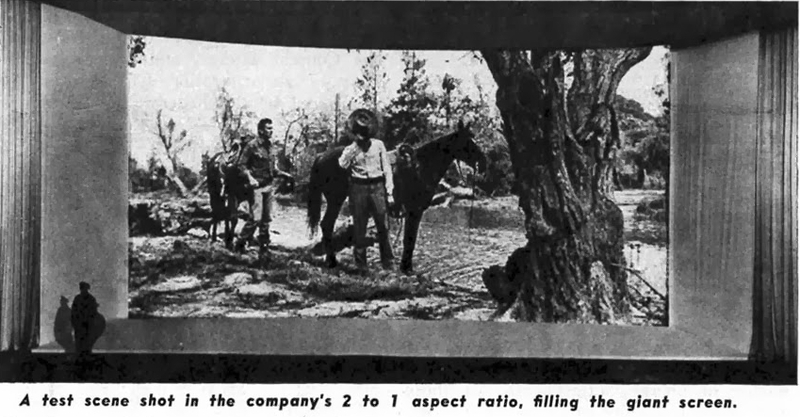 According to an article by Bob Thomas that appeared in the Anniston Star on July 7, 1958, Howard Hawks and John Wayne toyed with the idea of shooting Rio Bravo (1959) in the three-camera, 2.59:1 Cinemiracle process. I’m guessing the story of Rio Bravo changed a bit, since the finished film doesn’t boast a “variety of backgrounds” — just the sheriff’s office, a couple saloons, the hotel and a couple spots in Old Tucson. Filmmaker IQ: The History Of Aspect Ratio. This video from FilmmakerIQ.com may not teach you anything you don’t already know, but it sure is arranged and presented well. Up top is Hank Worden and Barry Sullivan in Sam Fuller’s Forty Guns (1957) in CinemaScope. Julie Adams, Universal-International And 3-D. The 3-D Film Archive has posted a terrific new article, “An In-Depth Look At Creature From The Black Lagoon.” This is a site that just keeps getting better and better — be sure to check out their history of the early-50s widescreen race. They also review the new 3-D Blu-ray edition of Creature From The Black Lagoon, appearing in the eight-disc set Universal Classic Monsters: The Essential Collection. I’ve heard many positive things about the film’s new transfer, but was alarmed to learn here of its re-convergence — director Jack Arnold’s unique, deeper effects set it apart from other 3-D pictures. Since Julie Adams stars in Creature, I opted for a couple stills from one of her other Universal 3-D films, Wings Of The Hawk (1953). It co-stars Van Heflin and was directed by Budd Boetticher. Sadly, it’s very hard to see these days. Speaking of Miss Adams, have you read her book? CAST: John Wayne (Hondo Lane), Geraldine Page (Angie Lowe), Ward Bond (Buffalo Baker), Michael Pate (Vittorio), James Arness (Lennie), Rodolfo Acosta (Silva), Leo Gordon (Ed Lowe), Tom Irish (Lt. McKay), Lee Aaker (Johnny Lowe), Paul Fix (Major Sherry), Rayford Barnes. Over the years, a number of things have kept Hondo from being recognized as the fine Western it is. First, there’s a tendency to discount all 50s 3-D films as slaves to a gimmick. Next, there’s the fact that it was released the same year as, and has a few similarities to, George Stevens’ Shane (1953) — which has taken its place as one of the genre’s giants. 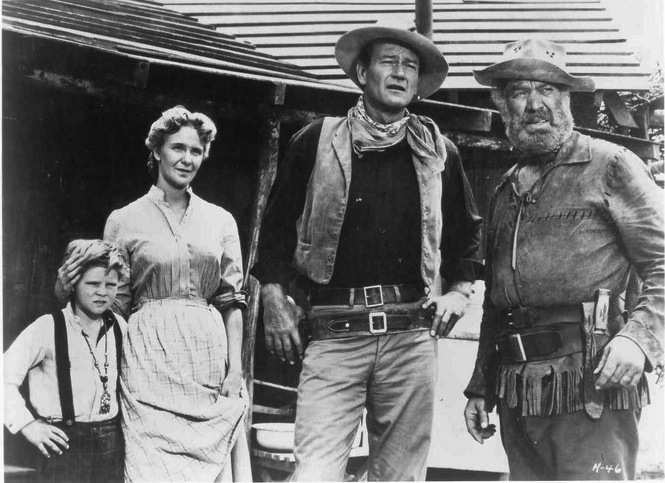 Then consider that Hondo sits among pictures like Rio Grande (1950), The Searchers (1956) and Rio Bravo (1959) in John Wayne’s filmography — it’s easy to be overlooked in a crowd like that. Then, and probably the toughest of these hurdles to overcome, is the decade or so the picture was virtually impossible to see. This absence was brought about by Wayne’s estate and included all the films produced by Wayne-Fellows and Batjac. (When Robert Fellows was bought out, the company was renamed Batjac, after the shipping line in 1949’s Wake Of The Red Witch.) The Batjac pictures resurfaced on DVD in 2005, with a very nice edition of Hondo being one of the highpoints. 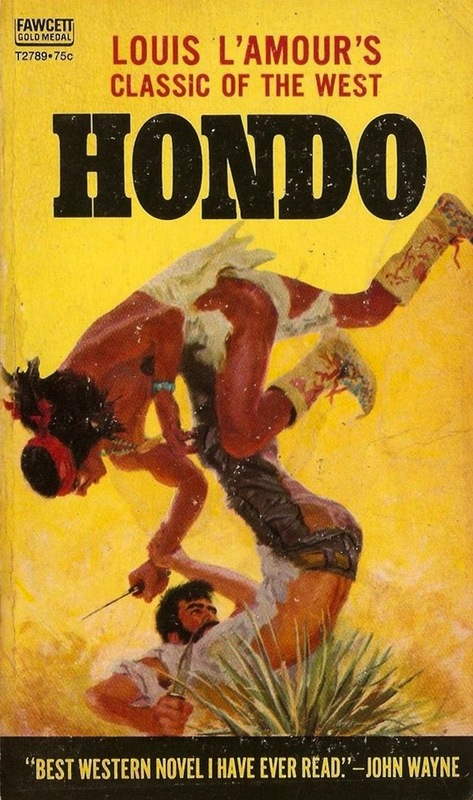 Hondo began as a Louis L’Amour story, “The Gift Of Cochise,” which James Edward Grant, Wayne’s scriptwriter of choice, adapted for Wayne-Fellows. (It appeared in the July 5, 1952 issue of Collier’s.) John Farrow was signed to direct, and Glenn Ford was offered the lead. 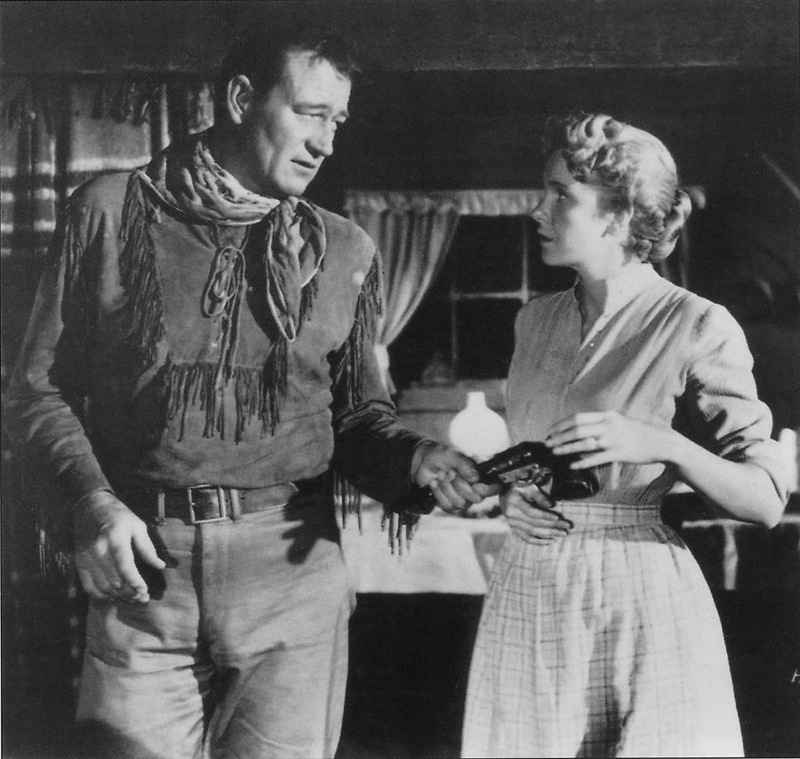 Ford didn’t want to work with Farrow after his experience on a previous Wayne-Fellows picture, Plunder Of The Sun (1953). Unwilling to fire the director, Wayne took another look at the script and decided to do it himself. Wayne is Hondo Lane, a Cavalry dispatch rider who turns up at the small ranch of Angie Lowe (Geraldine Page), located in the middle of Apache territory. He’s on foot, with his dog, having lost his horse fighting the Apaches. She says her husband is away and will be back shortly. Seeing through her lie — her husband doesn’t seem to be coming back — he urges her and her son (Lee Aaker) to seek safety from the Apaches. She’s never had trouble with the Apache chief Vittorio (Michael Pate) before, and decides to stay. From there things get a bit more complicated, as Wayne ends up killing Page’s ne’er-do-well husband (Leo Gordon) and being captured and tortured by Vittorio. There’s an exciting wrap-up as Wayne helps the Cavalry lead a number of settlers out of Apache territory. Grant’s script expanded the L’Amour short story considerably, and L’Amour then novelized the screenplay. Published to tie in the film’s opening, it was a bestseller — and is still in print today. Wayne-Fellows was in a distribution deal with Warner Bros., who’d seen runaway success with House Of Wax (1953) in 3-D, so it soon came to pass that Hondo was to be shot in 3-D. It would be the first time Warner Bros. would use its new All-Media camera rig — and the first of Wayne-Fellow’s productions in color (WarnerColor). All the Batjac pictures benefited from Duke’s working relationships with some of the best actors and technical people around. Behind the camera were cameraman Archie Stout and John Ford, who visited the location and ended up shooting a bit of second unit stuff. The cast included third-billed Ward Bond, Paul Fix in a character part, and James Arness — under contract to Wayne’s company and still a few years from being recommending by Duke for Gunsmoke. One clear break from what, and who, we expect from a John Wayne Movie turned out to be his leading lady — Geraldine Page. 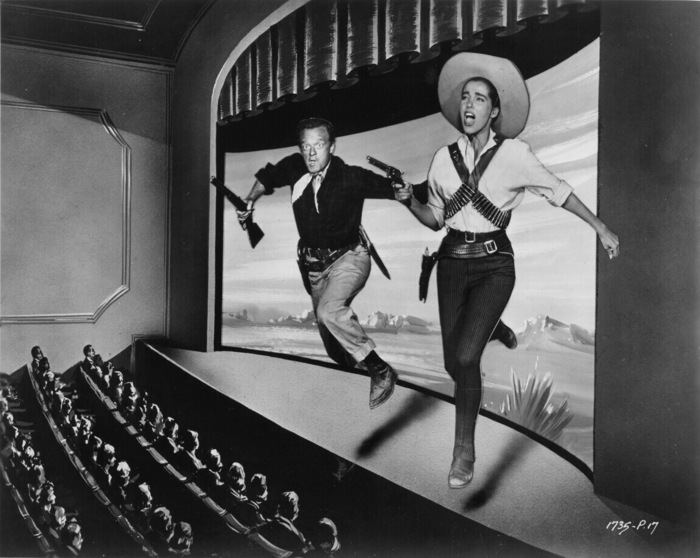 Cast and crew arrived in Camargo, Mexico, with shooting to start June 11, 1953. Thanks to the technical difficulties of shooting 3-D on location, things got off to a rather slow start. Setups were few and far between. The “cameraman” Wayne refers to is Archie Stout, a Batjac veteran who shared duties on Hondo with Robert Burks, who’d worked on House Of Wax and would go on to shoot some of Hitchcock’s finest films. But the 3-D cameras and frustrated DPs weren’t the only things troubling Wayne. He was in the middle of a divorce from his wife Chata. Their relationship was volatile, to say the least. Then there were his scenes with Page. What’s more, the Mexican temperatures sometimes topped 120 degrees. After wrapping in early August, the picture was quickly edited and scored for a Thanksgiving premiere in Houston. Its wide release in January of 1954 was very successful. There’s been a lot of debate over the years about the picture’s 3-D engagements. Some claim it played mostly flat, but that’s not the case. Almost all of its first run was in 3-D. 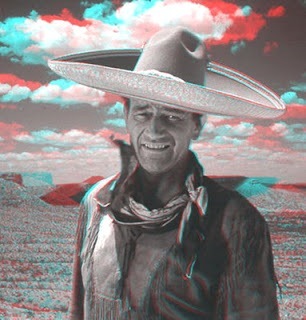 Whether flat or in 3-D, Hondo is an excellent film — not a great one. Its smaller size turns out to be a large part of its appeal, and it seems to hint at the look and tone of The Searchers (1956). Wayne’s performance is excellent. Despite his trouble working with Geraldine Page, their scenes together are very good, some of his best work. It’s easy to wish Wayne had called up Maureen O’Hara for Mrs. Lowe, but Page brings lot to the film. She was perfectly cast, and received an Oscar nomination for Best Supporting Actress. Ward Bond is terrific, making a big impression with relatively little screen time as Buffalo Baker, a grizzled old friend of Hondo’s. Leo Gordon is perfectly slimy as Ed Lowe — boy, am I glad when he gets shot. 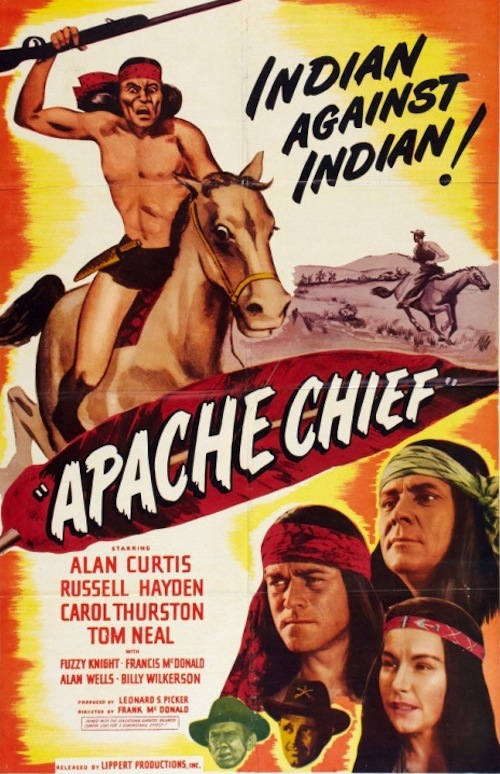 But acting honors have to go to Michael Pate as the Apache chief. He somehow manages to make Vittorio scary and sympathetic at the same time. 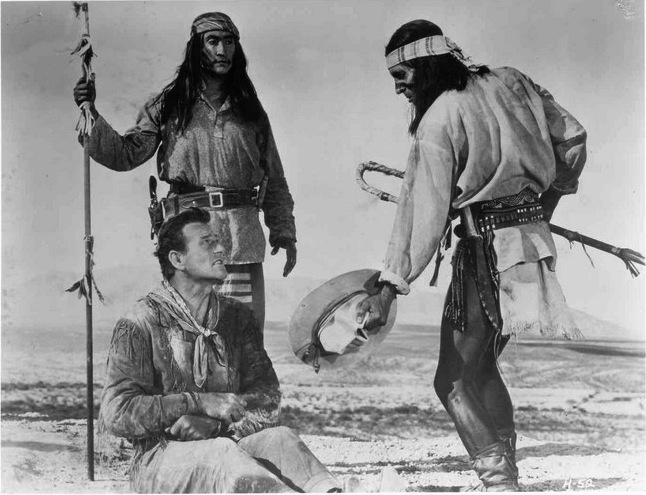 Hondo is held up as an early example of Hollywood treating Native Americans and their culture with respect. It does it without preaching or sacrificing the action audiences came for. This is a cowboy movie that doesn’t need 3-D glasses to give you plenty of depth. 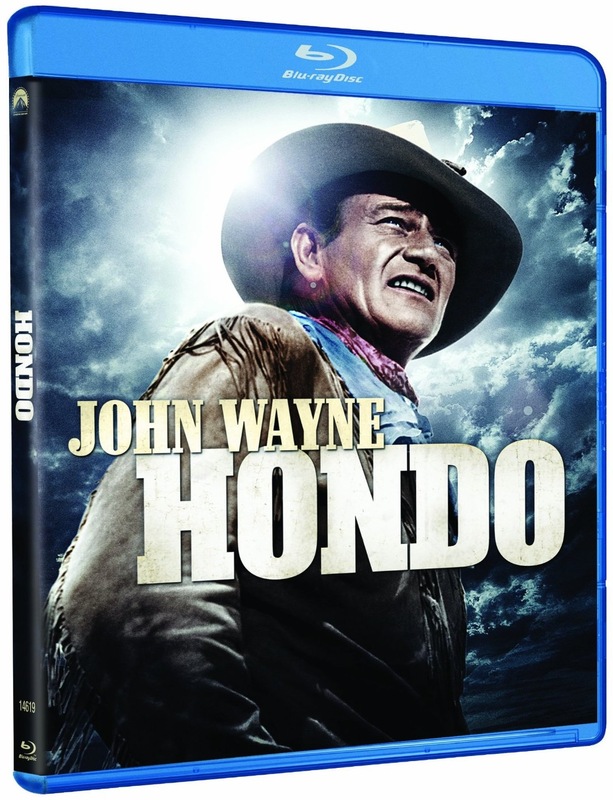 Paramount’s Blu-ray of Hondo is, in some ways, simply a high-definition version of their 2-D DVD from 2005. Both contain the same bonus material — an excellent collection of commentaries, documentaries, trailers, photos and more. (A couple of the documentaries didn’t make it over from DVD.) But the Blu-ray’s 1.75 ratio makes all the difference. This is clearly how this film was meant to be seen. It’s one of the nicest WarnerColor transfers I’ve seen, with its harsher contrast helping you feel the heat Wayne and company suffered through. Of course, there’s the typical jump in sharpness and detail that comes with Blu-ray. 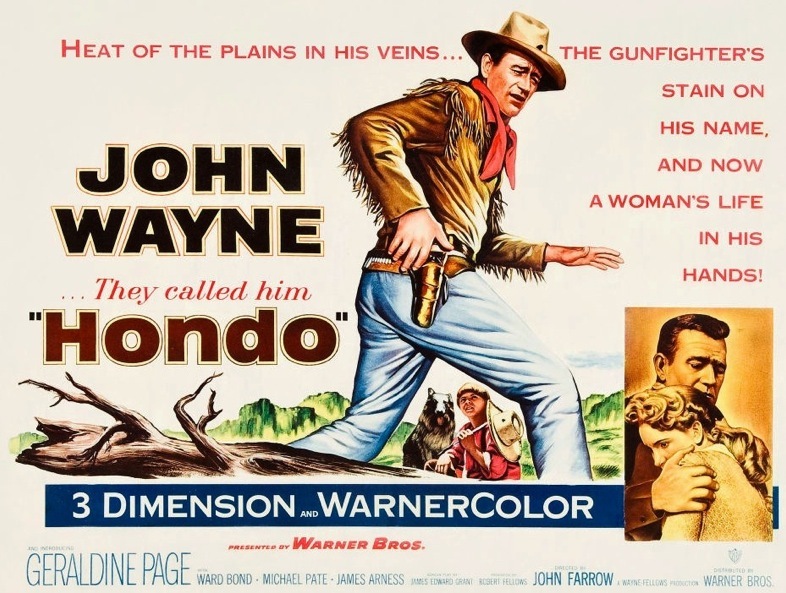 Hondo is an essential 50s Western, if for no reason other than Wayne made so few cowboy pictures during the decade. And for those wondering if Hondo’s worth the upgrade to Blu-ray, put on your old DVD. Look at all the dead space at the top and bottom. Yep, it’s worth it. 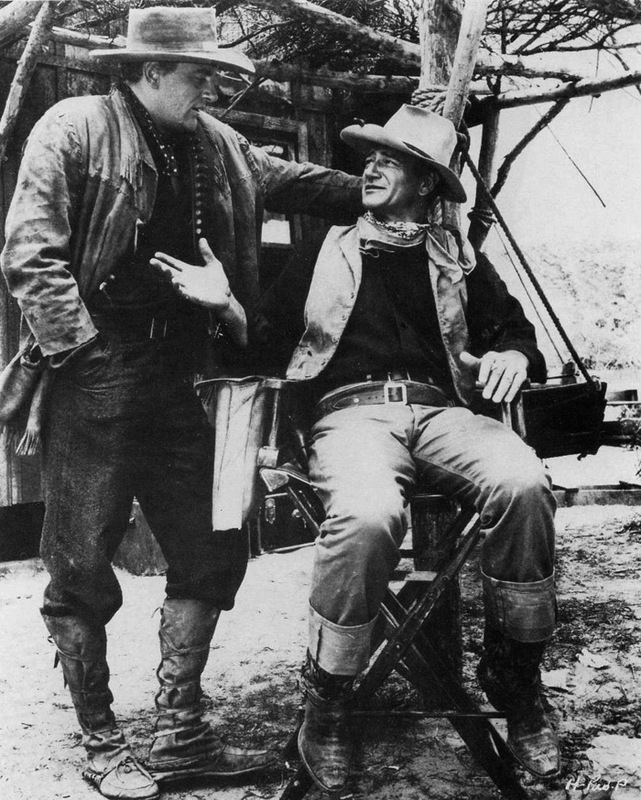 SOURCES: James Arness: An Autobiography; Duke, We’re Glad We Knew You; Duke: The Life And Image Of John Wayne; this fabulous article by Bob Furmanek and Jack Theakston; and more.